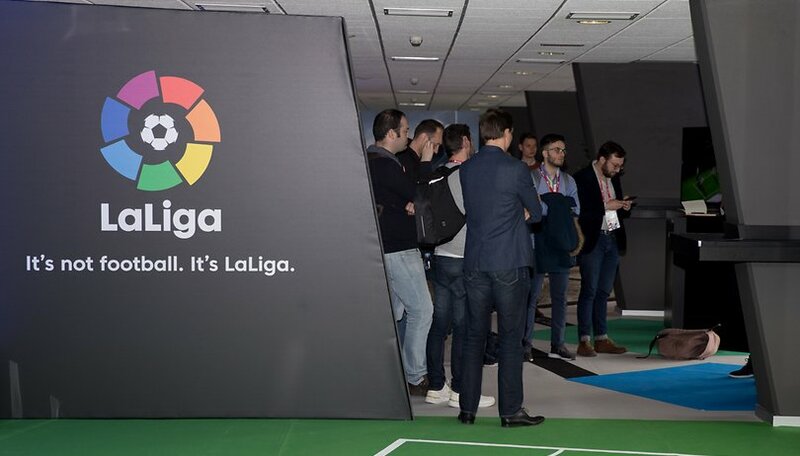 La Liga, the Spanish soccer league, took advantage of MWC 2018 to show its progress in broadcasting matches. Through a partnership with Intel, it allows viewers to access 360-degree playback and augmented reality statistics using True View technology, which was recently implemented in the NBA and NFL. Virtual reality and augmented reality are increasingly present in our daily lives. And if the technologies haven’t already won the hearts of the general public, La Liga’s approach could speed up the process. The Spanish Football Championship has set up a partnership with Intel to give fans access to more content. This allows virtual reality and augmented reality to be used during soccer matches, thanks to new technology that is gradually being introduced in Spanish stadiums. In order to implement this technology, 38 cameras were placed around the stadium. 2D images are then assembled to create a single 360-degree video. The final result is then further enhanced with a SkyCam that records from above the field. I was able to try out some virtual reality experiments at MWC 2018 with Samsung Gear helmets. You can relive 360-degree matches and see real-time statistics. The experience is pleasant and creates a much more immersive view in comparison to sitting in front of the television. La Liga also plans to broadcast post-game content that would allow spectators to explore the best moments of matches from their favorite angle, rather than watching what is broadcast by the TV production team. You can do more with virtual reality thanks to the 38 cameras installed by La Liga. This is especially the case with ‘Be The Player’, which lets you visualize what individual players see. It also makes it simpler to understand their decisions and analyze their performance. Viewers can also enjoy what La Liga calls the ‘Laser wall’, a technology that inserts statistics within the screen and even draws lines to help check offside penalties, helping reduce the risk of conflicts over calls the referees make. In short, soccer is becoming more modern and bringing itself up to date with how Americans have revolutionized the way we watch sports. So let’s hear from you! Are you ready to watch soccer matches in virtual reality?